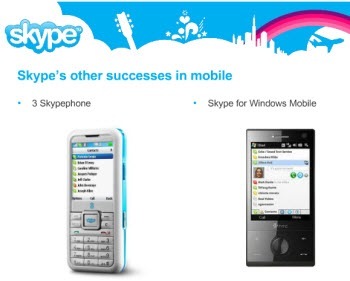 Current users: Make Skype available for consumers to download onto their existing mobile handsets. Skype Lite is architected for incorporation into any of over 100 Java-enabled handsets, including any supporting Google Android. In discussing Skype for Windows Mobile, Scott mentions that SMS messaging and File Transfer are being integrated into the forthcoming Skype for Windows Mobile 3.0. Find a number in the device’s native address book, click on the green “Call” button, the party is called transparently over Skype. If the call is to a Skype contact anywhere worldwide there is no additional cost; if to the PSTN, SkypeOut charges will apply at a minimum. But these phones are also capable of supporting Skype IM’s presence information and chat conversations worldwide. Carriers: The Skyephone relationship with Hutcheson 3, using embedded iSkoot firmware, has certainly been a success. Most importantly, its “free calling” marketing campaign has certainly helped 3 acquire new users who previously would never have thought of getting such a smartphone, even if it has a limited feature set (relative to, say, iPhone, BlackBerry or Android). From the Skype Lite announcement at CES it is apparent that Skype is developing relationships with carriers in at least ten other countries, including the U.S. But details of the specific carrier relationships have yet to be announced. keyboard: QWERTY or T9? this makes a huge difference as to how much Skype IM will be used. display size: how readily and effectively can the device display Internet-originated content? battery life: will there still be enough battery life after a day of work to enjoy an evening of entertainment without a recharge? overall user interface: bottom line for the user experience – how readily can I get access to the services I want, using a familiar calling algorithm? And all this leads to “What is the business model for Skype”? That will be the subject of another post.